Choosing an IT company for your business can be a trying process, especially when you’re in Sydney and also looking for a local business to be your IT partner. It goes without saying that you’re looking for the best IT company Sydney has to offer. But where do you begin looking for such a thing? In your search, you may find yourself overwhelmed with the choices of IT company Sydney wide. While you may not need an IT company right next door — it’s definitely beneficial to have an IT team be accessible within the same city. What Do You Want From Your IT Company? Are you looking for a one-off project, or ongoing IT support? Do you have employees that work out of the office (either from home, or on the road)? Consider if you require mobile device management or WAN solutions. Does your business rely on handling sensitive information and/or critical deadlines? Consider if you require support that can react urgently as required, or if you only need 9-5 support. Do you want an IT company that knows you and your business? Or are you just looking for someone to come in, fix the problem and move on? What Can IT Support Do For Your Business? Consulting: Consult and evaluate your business goals in order to create a strategic approach to getting your IT where it needs to be. Managed IT Services: Utilise your IT company to monitor your network and provide ongoing support across all issues. Project Management and Deployment: Scope and manage any IT project, from concept to reality. Workstations and Mobility: The right IT company won’t just perform digital services, but they can also maximise your office efficiency by creating effective workstations using up-to-date PCs and mobile devices. Cyber Security: This is the number one security concern for any business, so don’t let it sit on the backburner. A good IT company will help you audit and evaluate your cyber security and ensure your data is fully protected. Networking and Servers: Upgrade your networks and servers, and then have your IT company monitor them for any downtime or suspicious activity. Internet and Connectivity: Implement an SDWAN solution, or upgrade your internet connectivity. It can be complicated setting up connectivity for an entire office, so let your IT company handle it. 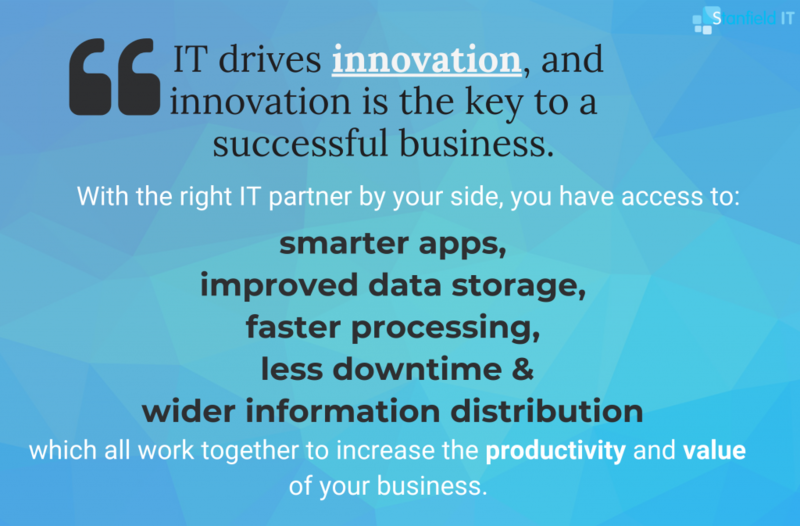 This is just the tip of the iceberg when it comes to the kind of invaluable support an IT company can provide for your business. We feel that you should never underestimate the importance of IT in business. IT drives innovation, and innovation is the key to a successful business. Look at any IT company Sydney wide and you’ll see there are a lot of similarities, and it can be hard to distinguish one from another. What makes one provider better or more suited for your business? There are a number of things you can look for in these companies in order to narrow down your selection to the IT company that will work best for you. When you look up the IT company, have a look at any reviews or testimonials you can. Seeing positive feedback from satisfied customers can assure you that they are competent and recommended by previous clients. You can often see these reviews on Facebook or Google (testimonials published on a company’s website can be suspect, for obvious reasons). If you cannot find reviews, consider asking the company for references. Treat the website as a preview into the level of professionalism of the IT company. If we Google ‘IT company Sydney‘, the first promoted link does not have a secure website, which doesn’t set a great impression for a business that focuses on IT services. Another promoted link doesn’t load the website at all. Look for concise layouts, a clear message, as well as good visibility on their location and are they easy to contact? Everyone has to be at least a little bit concerned with pricing, of course. But we all know the adage ‘you get what you pay for’ — so cheaper is not necessarily better. However, also consider things like, do they offer flexibility on payment arrangements? Do they bill by-the-hour, or smaller increments? Do they have a callout fee for onsite work? Can you arrange a monthly flat fee for ongoing support? Consider the different payment options that would work for your business. 4. Are They a Like-Minded Business? That is to say, do they understand your priorities and needs as a business? This means they should be able to truly listen to your opinion, and your needs. They should be able to understand the challenges that you face, and be able to come up with a tailored strategy for you. A like-minded business understands that if your network goes down, it is literally costing you money. 5. What is Their Support Desk Process? If you can only ever submit requests during business hours, there’s going to be a problem — since IT issues are not restricted to simple business hours. A good support desk system will allow you to log support tickets around the clock, which allows everyone to track their progress without issues getting lost amongst regular emails. What are their response times are for specific issues? Bear in mind that there is no one size fits all turnaround time and resolution times will vary depending on the scope of the issue. If a company assures you that any issue will be resolved in X amount of time, be wary. Review what qualifications and certifications they hold, and what is their area of focus? Do they have the capacity to support a large enterprise, or are they better suited to small and medium size business? Are they able to confidently support your Mac computers or do they only know Windows? Do they hold certifications in addition to basic IT support qualifications? e.g. are they a Microsoft partner? Look for certifications from Cisco, Microsoft, Google, SAP, Oracle, SQL, amongst many others. Not every IT company will hold every certification, but consider your business focus and see if the IT company is qualified to support you appropriately. 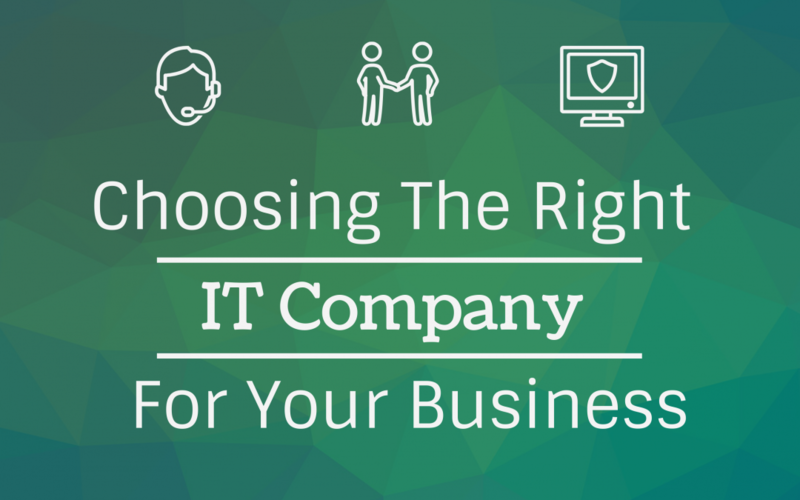 The path to choosing an IT company to support your Sydney business is not very complicated, but you should absolutely take care to choose the right partner for you. Choosing an IT company without taking care to vet them first may lead to you forking out a whole lot of money only to be stuck back at square one when they don’t work out for whatever reason. The right IT company in Sydney should easily be able to demonstrate their worth to you and show that they appreciate how important your business is.